Immediately as you walk into the MCA exhibit, you are faced with that overpowering, bright red. That red that reminds you of the restless, suffering of her body. The red from the blood drops stained on the crisp white dress she painted in ‘The Two Fridas.’ Not only this, but you also are surrounded by long, lamentable wails from a woman, as well as the beautiful voice of a man singing a love song. Although the sources of the sounds are not visible, they follow you throughout the space. It becomes impossible not to feel Frida’s presence. On May 3rd, the Museum of Contemporary Art at Chicago opened the exhibition Unbound: Contemporary Art after Frida Kahlo, which focuses on the artist’s groundbreaking impact on art and the many ways we have seen others take on similar themes Kahlo once did. Curated by Julie Rodrigues Wildholm and Marjorie Susman Curatorial Fellow Abigail Winograd, the exhibition hopes to have viewers look past her popularity and really reconsider Frida for her art and the way it has moved the world. The participating artists are diverse in their backgrounds and practices. Together, these artists help to form a dynamic show that allows the viewer to witness the loose forms that keep Frida’s nature alive after death. When you enter the exhibition, the center red wall strikes you. It is the same wall where you find two of Frida’s paintings. As you walk around the first gallery room you are swiftly being moved around the space through video, performance, installation, sculpture, drawing and painting. The variety of work not only creates a movement but also shows the real care and research put into the exhibition. Decisions in selection and organization of the art made sense and were seamless. 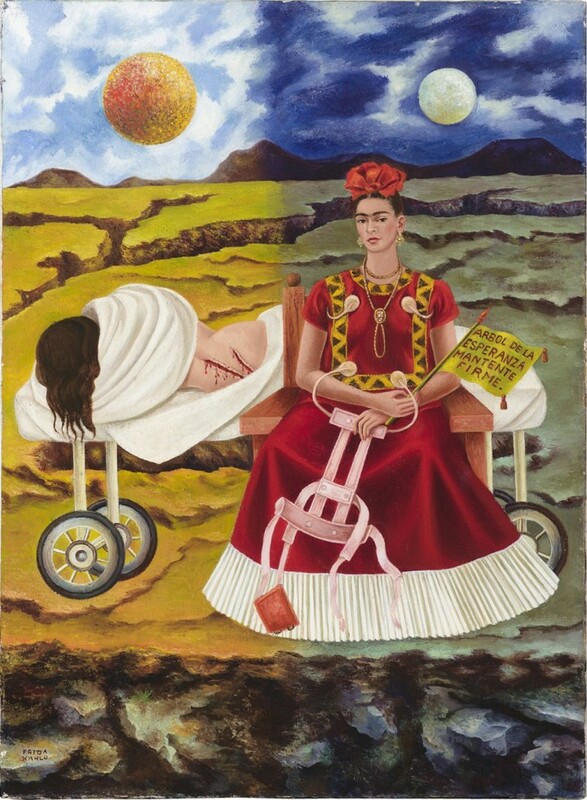 Each room addressed one or two themes that were seen in Kahlo’s work, and the art would appropriately demonstrate the influence Frida bestowed to the contemporary works of art. Although the exhibition could have easily been larger, the size seemed right if not close to right. Perhaps the most notable decision in organization was the location of Shirin Neshat’s unforgettable video installation ‘Turbulent’ (1998). 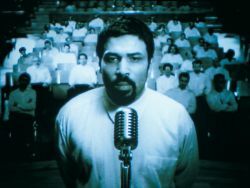 Neshat’s piece was placed in the center of the O-shaped exhibition but was out of sight once the viewer steps inside the show. The sounds of ‘Turbulent’ haunt you as you walk around and the piece becomes an ideal halfway point in the exhibition. Another curious but smart move was the approach curators took towards the theme of nationalism which was very apparent in Frida’s work. Identity was important to her but since the rise of globalization and technology artists have felt differently than Kahlo. Contemporary art has questioned identity and rather than show artists that have explored ways to celebrate their nationality (yes, we’re looking at you ’90s art), organizers have pushed to show a valid and current reality. Continuity can become a slippery slope given the variety and amount of art that exists following Frida’s pioneering artwork. However, Unbound compiles a solid and brief exhibition that would have Frida nodding, lifting her shot of Tequila, and offering a salud. Frida Kahlo’s work is unmatchable, inspiring and interesting in an infinite number of ways, but it is especially interesting when we get to see the intangible depth she has left in our mortal world and the way artists have learned to take on themes that once circulated in her art.